Last Tuesday I visited a fellow blogger in Chicago, IL and both of us visited the Smith Museum of Stained Glass Windows, which is free and open to the public on Navy Pier. Below you will find a selection of some of the stained glass which I photographed while visiting the Museum. Remember that earlier this summer I mentioned that I am in Chicagoland for the summer months and if anyone would like, I would be happy to visit with them in Chicago. Most of the available stained glass depicted iconic moments in Christianity such as the Magi's Adoration of the Christ Child (pictured below). 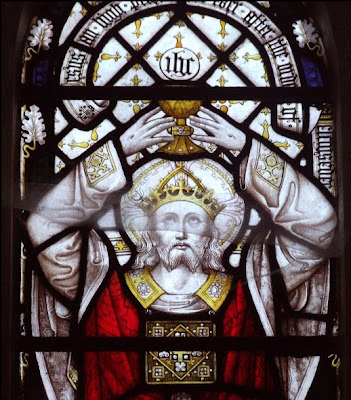 Even the Old Testament figure of King Solomon - who is venerated as a saint in Catholicism - was prominently featured in a Stained Glass Window. Above all, the Smith Museum of Stained Glass Windows reinforced the idea that one's environment is conduce to one's prayer. If we only frequent buildings that have eliminated statues, icons, paintings, stained glass, etc., then we are depriving our senses of the joy that can be obtained through the viewing of such a masterpiece. Such masterpieces transcend the typical and force us to contemplate the wonders of the Divine God, who is rightfully honored with many beautiful paintings, icon, glass windows, Cathedrals, and other wonders throughout the world. Q. 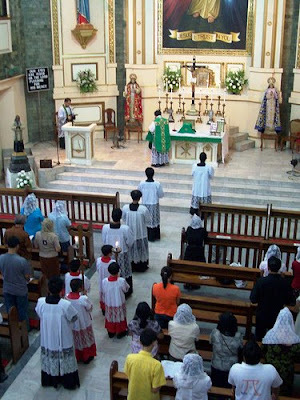 Is it allowed for a parish church to held two sung masses (either one Solemn High Mass and another in Missa Cantata; or both Missa Cantata) in Extraordinary Form of the Roman rite on Sundays, important/great feasts and other holy days of obligation? Assuming that the church will only have two masses for those days mentioned. 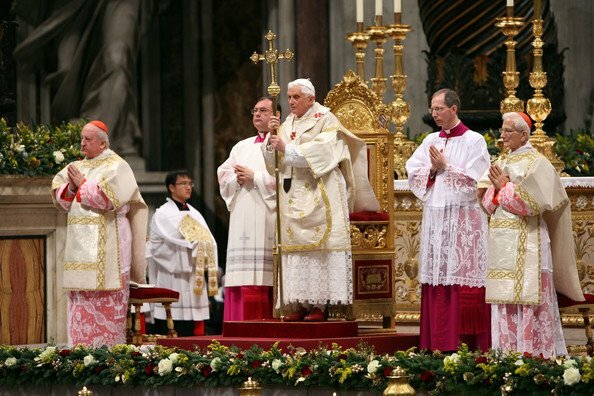 A: It seems pretty clear that according to Summorum Pontificum, this is allowed for the typical parish, so long you are not "depriving" people who want to attend the Novus Ordo of that opportunity. Looking at rubrics alone, indeed, you may have as many Sung (Missa Cantata) or Solemn Masses (Missa Solemnis) each day as you wish. You need to have a schola for each, so that may be a problem to get singers. One Mass on any day is the "parochial", "community" or "conventual" Mass. This is the Mass which is the primary Mass of the day. If there is a Missa Cantata or Solemnis, the more solemn form would be automatically designated as such. 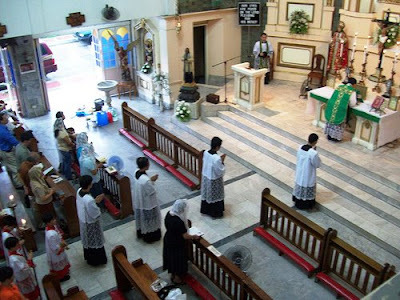 Q: If the parish church has two masses in Extraordinary Form of the Roman rite on Sunday, is it allowed that both masses have the Asperges before the mass proper? A: The Asperges/Vidi Aquam is done only once and only on Sundays. It is done only before the principle of main Mass, as defined above. For additional Masses it is omitted. If no Sunday Mass is sung, it is omitted completely, as it is never done unless at a Sung Mass or Solemn Mass. Q: Typically, how long does a chanted Matins and Lauds will take, assuming that it is chanted in Latin and following the 1962 Roman Breviary? A: It varies a bit. Generally, for a feria or a third class feast (one nocturn - three lessons), Matins would take about an 45 mins- 1 hr. For major feasts (three nocturns - nine lessons), figure about 1 hr - 2 hrs. Lauds is about like Vespers, perhaps 30 - 45 mins. 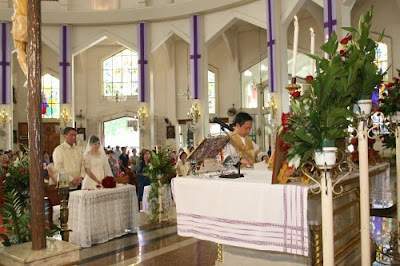 Image Source: Ochie Bumanlag's Wedding, Antipolo Cathedral, Rizal, Philippines via the Flickr Profile of dennisraymondm33. 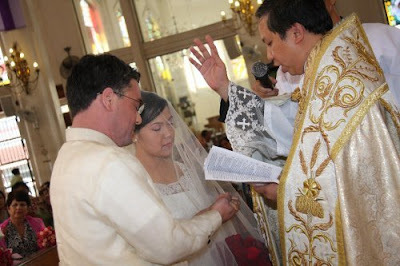 Updated: It has also been recommended to me that those preparing for a Nuptial High Mass should read the Guideline for Liturgies Services for the Nuptial High Mass (.pdf) available on the website of Sancta Missa. I wish to aid you in this effort by mentioning that the Mozart requiem Mass is not the first thing that comes to mind for a nuptial Mass. The Sanctus for that Mass would work, but the Kyrie and Agnus dei seem a little too mounrful. The C minor's solemnity is better suited to the occasion, though it is incomplete. You might want to add Haydn's Kleine Orgelmesse to the list. It clips along at a nice pace and is decently suited to the character of the liturgy. Polyphonic settings are always a plus and preferred by the Church. In general, I try to avoid symphonic settings, though for a wedding, something out of the ordinary would be nice. One thing I learned while in Chicago [at the Sacred Music Colloquium] is that symphonic Masses are NOT suited to a Novus Ordo Mass. There is so little liturgical action that the priest finds himself waiting for the music to end. Back to polyphonic Masses, one that I sang recently that is very well done is the Mass for five voices by Byrd. I tried looking for it on Youtube to no avail. Perhaps you will fare better. Schubert is lovely but I hesitate to recommend it as he makes inappropriate textual changes (leaves out a portion of the Credo and includes the intonation for the Gloria). 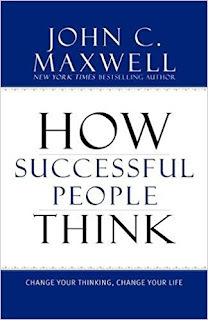 John C. Maxwell's "How Succesful People Think"
I just had the opportunity to read and review John C. Maxwell's "How Successful People Think". As a relatively small book (approximately 130 pages), it is an excellent "pocket-guide" resource for anyone interested in stimulating creative thought. Critical thinking is appropriately encouraged to the point of adoration in the American education system, though many students still fail to develop effective thinking. As a practical thinker myself, I believe Maxwell's guide is a fantastic resource to anyone interested in learning how to think. I would like to pass along this message from Jovan concerning Little Office of Christ the King (also available in PDF). Greetings in Christ and our Lady! The 'Little Office of Christ the King' which I compiled is based on various devotional 'Little Offices' from before the Second Vatican Council. There were, to my knowledge, such 'Offices' for the Immaculate Conception, St Joseph and the Holy Angels, with possibly others as well. They were designed as devotions to be said after the corresponding Hour of the Divine Office. If you are not yet bound, under pain of sin, to recite the Divine Office, there would be no problem in substituting, but I would highly recommend either saying the Divine Office or the full Little Office of our Lady and then saying the appropriate hoiur(s) of the Little Office of Christ the King afterwards. Also, I should point out that, while everything in the Office is taken directly from sources approved by the Church, namely the Roman Breviary, the whole compilation has never been submitted for approval by any competent ecclesiastical authority. Visit Devotional Catholicism for a contest featuring as its prize a Statute of Our Lady of Mount Carmel. The contest involves posting the name of a devotion that is not already listed on the list started by the site's founder. The text and images are an excerpt from a post on The Society of St. Hugh of Cluny: This evening a Missa Cantata was celebrated at St. Gabriel's, Stamford in honor of Our Lady of Mt Carmel. The pastor, Fr. Cyprian LaPastina, was the celebrant and deacon Aaron Huberfeld of the Institute of Christ the King preached. 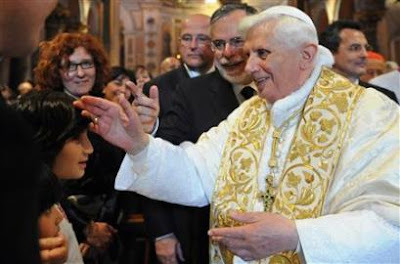 According to the Associated Press, "Pope Benedict XVI broke his right wrist in a fall in his chalet while vacationing in the Italian Alps and underwent successful surgery Friday, hospital officials and the Vatican said." 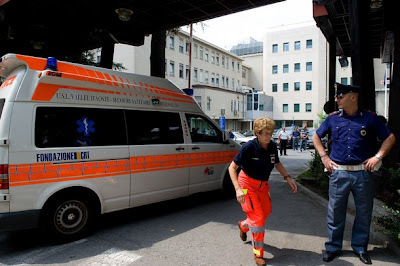 He was taken to Umberto Parini hospital in Aosta (pictured above). Let us pray for the Supreme Pontiff's recovery. 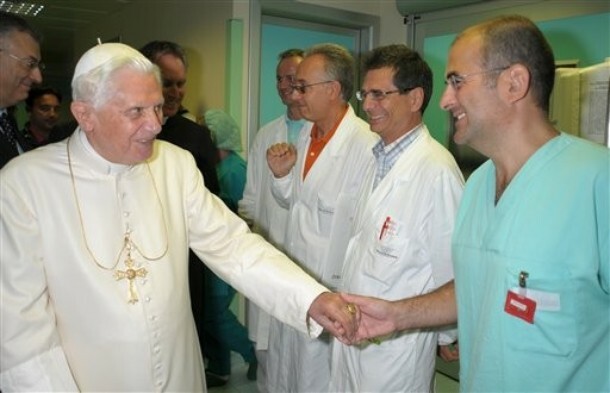 Update: In the above image, Pope Benedict XVI greets Dr. Amedeo Mancini who performed the operation on his wrist. This image was taken as the Holy Father was leaving the hospital; he is expected to make a smooth recovery. His wrist will be in a cast for approximately a month. Deign, we beseech thee almighty God, that we be brought to the same place in heaven as your prophet and our father blessed Elijah, who we believe to have been marvelously taken up in a fiery chariot, and rejoice in the fellowship of your saints. Through our lord Jesus Christ your son...etc." 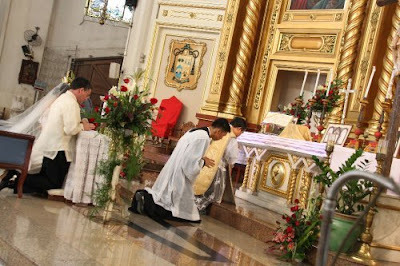 This is an image of a Solemn High Mass for the feast of Sts. John Fisher & Thomas More, in the parish church of St John Fisher (built 1962-64) in West Heath, South Birmingham. The Mass was said by Fr. Philip Cleevely. In the roles of deacon and subdeacon are Fr. George Grynowski and Fr. Anton Guziel respectively. Fr. Grynowski is the pastor of the parish and preaced the sermon. Note: The blue pole is there because it is to become part of a new baldachino. 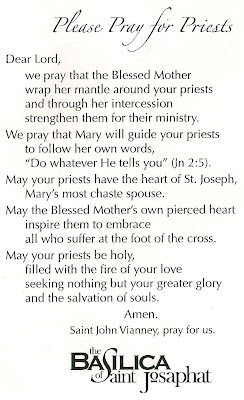 When I visited the Basilica of St. Josaphat this past Sunday in Milwaukee, Wisconsin, I picked up this prayer card. I am glad to see that this ornately decorated and beautiful testament of Catholicism is promoting the Year for Priests (June 19, 2009 - June 19, 2010). There photos are from the Flickr Profile dennis_raymondm30. 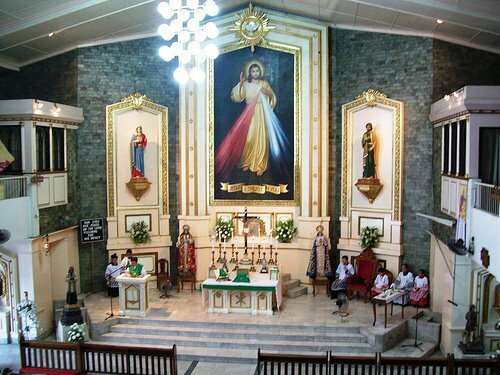 These images are from the Parish of Our Lord of Divine Mercy, Sikatuna, Q.C., Philippines. Today I travel to St. Stanislaus in Milwaukee, WI as I did last year. In Milwaukee I will be watching the Brewers v. Dodgers. So, there will not be any other posts today. 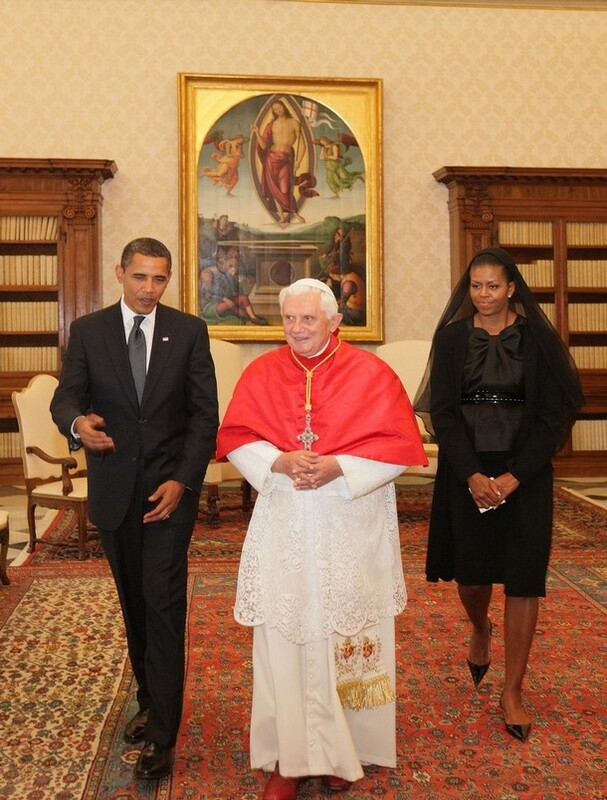 Today Pope Benedict XVI met with President Barack Obama and his wife, First Lady Michelle Obama. Of note, the First Lady wore a veil while in the presence of the Holy Father. I am quite pleased to see this tradition being observed. My comments are few and in red below. Please comment with your thoughts on this development. 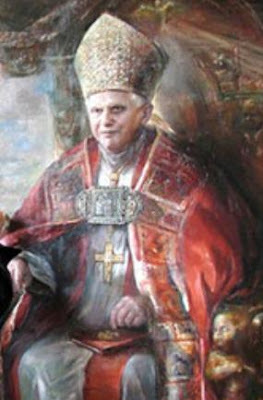 1.The goal of guarding the UNITY OF THE CHURCH, with the solicitousness of offering to all the aid to responding in opportune manner to this vocation and divine grace, belongs in a particular way to the Successor of the Apostle Peter, who is the perpetual and visible principle and foundation of the unity both of Bishops and of the faithful1. The supreme and fundamental priority of the Church, in every age, of leading men towards the encounter with God must be favored through the effort of uniting the common witness of faith of all Christians. 2. 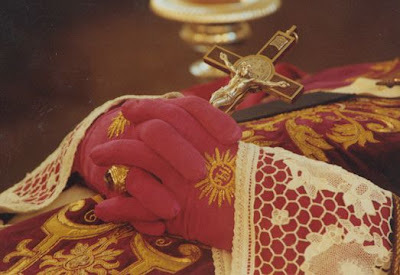 In faithfulness to this mandate, following the act with which Archbishop Marcel Lefebvre, on June 30, 1988, illicitly conferred the episcopal ordination on four priests, Pope John Paul II, of venerable memory, instituted, on July 2, 1988, the Pontifical Commission Ecclesia Dei "whose task of collaborating with the bishops, with the Departments of the Roman Curia and with the circles concerned, for the purpose of facilitating full ecclesial communion of priests, seminarians, religious communities or individuals until now linked in various ways to the Fraternity founded by Mons. Lefebvre, who may wish to remain united to the Successor Peter in the Catholic Church, while preserving their spiritual and liturgical traditions, in the light of the Protocol signed on 5 May last by Cardinal Ratzinger and Mons. Lefebvre"2. 3. In this way faithfully adhering to the same purpose of serving the universal communion of the Church also in her visible manifestation and making every effort so that to all those who truly desire unity it is made possible to remain in it or to find it anew, We have desired to widen and renew, with the Motu Proprio Summorum Pontificum, the general indications already contained in the Motu Proprio Ecclesia Dei regarding the possibility of using the Missale Romanum of 1962, through more precise and detailed rules3. 5. 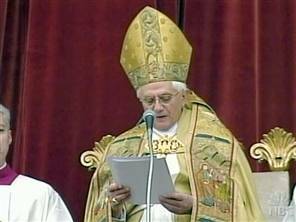 Since the questions which must be dealt with the Fraternity are of an essentially doctrinal nature, We have decided - twenty-one years after the Motu Proprio Ecclesia Dei, and as We had planned to do4 - to restructure the Commission Ecclesia Dei, linking it more directly with the Congregation for the Doctrine of the Faith. b) The Commission has its own order, including a Secretary and Officials. 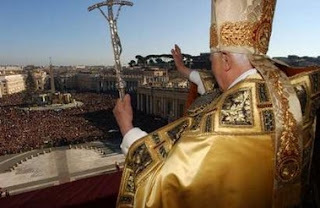 c) It belongs to the President, aided by the Secretary, to present the main events and questions of a doctrinal nature to the study and discretion of the ordinary instances of the Congregation for the Doctrine of the Faith, as well as to submit the conclusions to the superior judgment of the Supreme Pontiff. We earnestly invite all to pray to the Lord incessantly, through the intercession of the Blessed Virgin Mary, "ut unum sint". 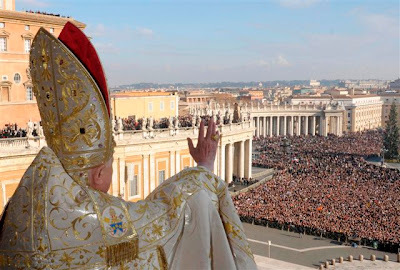 Given in Rome, at Saint Peter’s, on July 2, of the year 2009, the fifth of Our Pontificate. 1. Cfr Conc. Oecum. Vat. II, Const. dogm. de Ecclesia, Lumen gentium, 23; Conc. Oecum. Vat. I, Const. dogm. de Ecclesia Christi Pastor aeternus, c. 3: DS 3060. 2. Ioannes Paulus II, Litt. ap. motu proprio datae Ecclesia Dei (2 Iulii 1988), n. 6: AAS 80 (1988), 1498. 3. 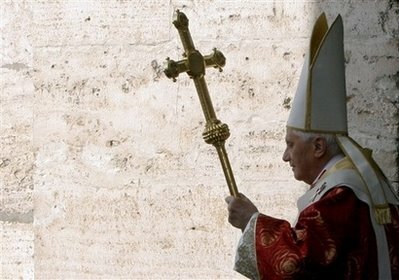 Cfr Benedictus XVI, Litt. ap. 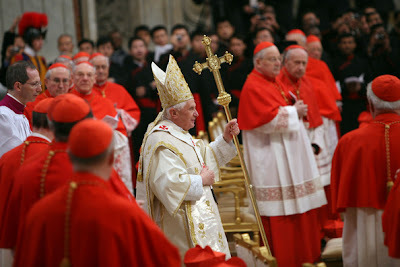 motu proprio datae Summorum Pontificum (7 Iulii 2007): AAS 99 (2007), 777-781. 4. Cfr ibid. art. 11, 781. Video from the traditionalist Roman Catholic Benedictine Abbey, Sainte Madeleine, founded in 1978 by Dom Gérard Calvet (1927-2008). 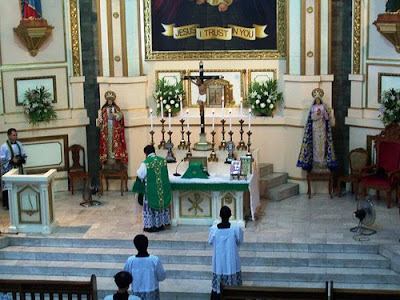 Our Lady of Mount Carmel Church, 259 Oliver Street, Newark, New Jersey, will hold a Solemn High Traditional Latin Mass in honor of its patroness, on the titular feast of the parish, July 16 at 12 noon. The Mass will be immediately followed by a procession with the Statue of Our Lady through the parish accompanied by a full symphonic Italian feast band and fireworks. It had come to my attention this afternoon that my sidebar's Paypal Donation Button was not working properly. It would not allow anyone to connect to the donation screen. So, I have corrected the html error and the donation feature is working. However, anyone who had attempted to donate to the blog in the past two months, approximately, would have been unable to do so. So, if you encountered problems when attempting a donation, please try again. Your donations help keep this blog operating. I remain extremely grateful for all donations. A Catholic Life would like to thank Fr. 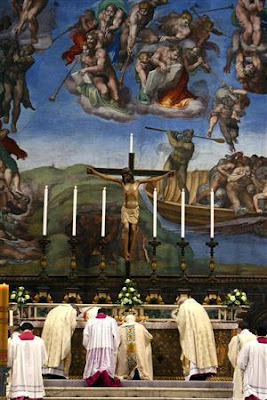 Michael Troha for writing the following article, in honor of the 2 Year Anniversary of Summorum Pontificum. Please pray for and support Father in his ministry as he serves as Pastor for Immaculate Conception Church in Willoughby. Over the past few years several parishioners had asked me about the possibility of having a Tridentine Mass at our parish of Immaculate Conception in Willoughby, Ohio. At that time my response was that we should support the efforts at Immaculate Conception church in Cleveland, where I was formerly the pastor, which has a Tridentine Mass three times a week. 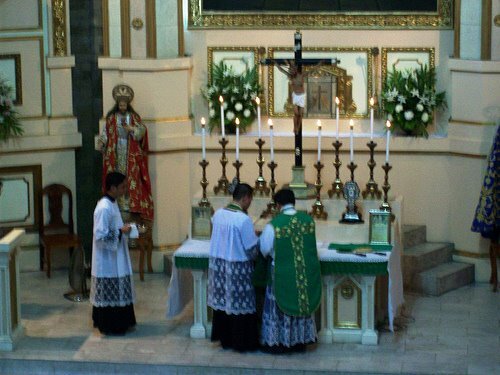 But with the promulgation of Summorum Pontificum I began the extra-ordinary form of the liturgy every first Friday evening. Having had very good attendance over the first year I decided to have the Tridentine Mass every Friday evening at 7:30 PM. Our number of people attending is about 50 people each Friday. 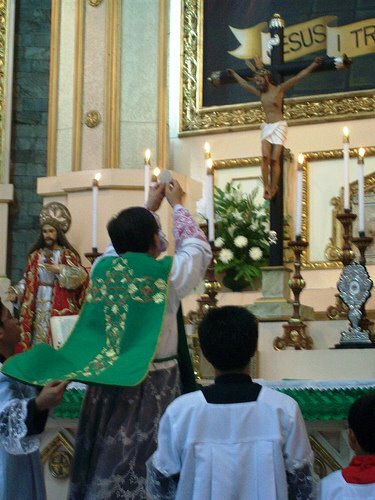 When I am away from the parish it has not been a problem to enlist the help of other priests in the diocese who are willing to help and enjoy the opportunity of celebrating the extra-ordinary form of the liturgy. This past December the parish celebrated the 50th anniversary of the dedication of our “new” church. To commemorate the day I celebrated the extra-ordinary form of the liturgy at the regularly scheduled 8:00 AM Mass. The same crowd that attends the 8:00 AM Mass year round was there for the Mass. I did not receive any negative comments. I did receive a few very positive comments. I think that if the parishioners are supportive we could have a Tridentine Mass at one Sunday liturgy every week. 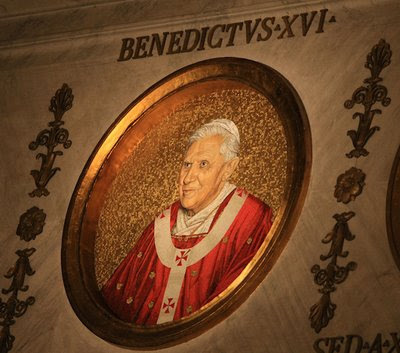 Today the Church observes the second anniversary of the publishing of Summorum Pontificum, the long-awaited motu proprio of Pope Benedict XVI replacing all former "indults" and freeing the Mass of All Times, the Traditional Latin Mass. 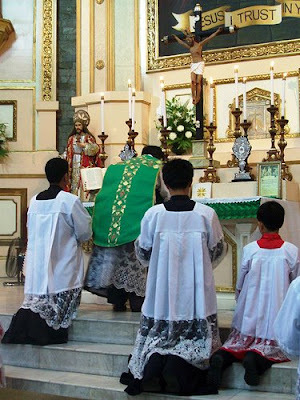 No longer would a priest have to ask permission of his bishop to say the Mass as the Mass is to be readily offered and available to all of the Faithful. In honor of this two year anniversary, I offer the following reflections on those individuals who have made such a celebration possible. It is at this time that I wish to especially remember Archbishop Marcel Lefebvre, who resisted the Second Vatican Council's false propositions of ecumenism, religious liberty, and the altering of the Mass of All Times. It is through his witness and the formation of the Priestly Fraternity of St. Pius X (SSPX) that the Mass of All Times has spread. 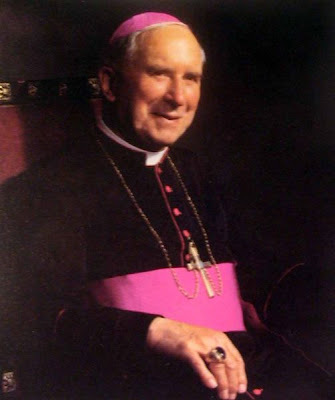 And, I will venture to say that without Archbishop Marcel Lefebvre's role, the Traditional Latin Mass would have been at last forgotten and no organized resistance to the change would have existed. It is Archbishop Lefebvre who has been slandered in recent years. The cause of canonization of his saintly mother has long been forgotten. Instead, in the words of Bishop Bernard Fellay during a sermon in Paris following Archbishop Lefebvre's death said, "Archbishop Lefebvre has gone, but the Mass is saved, the Catholic priesthood is saved..." Because of his resistance to all of changes affecting all of the Sacraments, the Society of St. Pius X is largely responsible for Pope Benedict XVI's issuance of the motu proprio and then the clear declaration that the Bishops of the Society of St. Pius X consecrated by Archbishop Marcel Lefebvre are not excommunicated. In the words of Father Franz Schmidberger at the Requiem Mass of Archbishop Lefebvre, "The work of the Archbishop on this earth is accomplished. Now begins his ministry as intercessor in eternity. 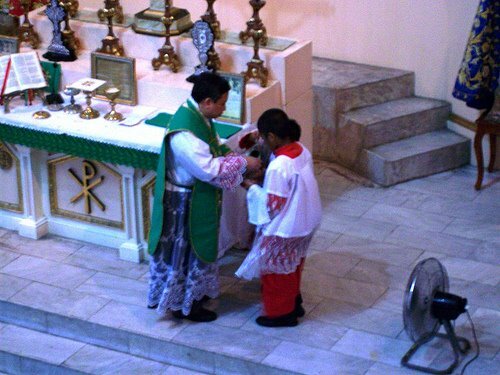 He has given everything he could give...the miracle of a new generation of priests." 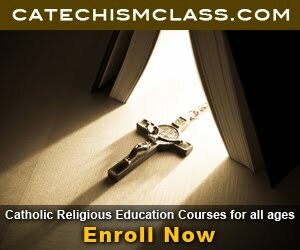 Archbishop Lefebvre only wished to teach that which he himself was taught in seminary. He wished to hand on the Catholic faith as taught and celebrated for the past centuries. And his resistance has directly led to the establishment of the Ecclesia Dei Commission and the motu proprio, Summorum Pontificum. I highly encourage the reading of Apologia Pro Marcel by Michael Davies as well as Open Letter to Confused Catholics and The Mass of All Times. 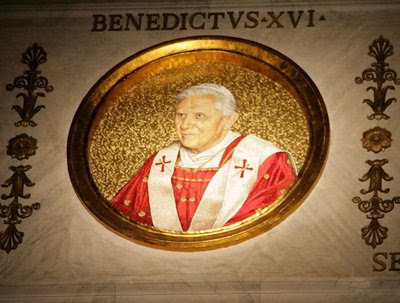 The response to Pope Benedict XVI's motu proprio Summorum Pontificum shows his wisdom and foresight in freeing the Old Mass in Latin. The Old Mass in Latin is said daily at 56 locations in 47 dioceses across the United States. 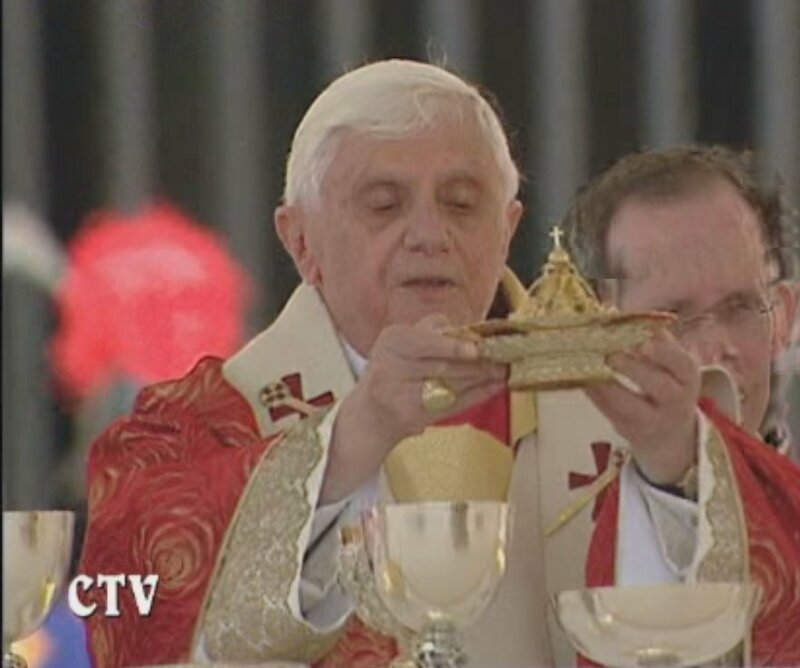 Therefore, on this day, July 7, 2009, we remember 2 years of Summorum Pontificum, in large part due to the saintly wisdom of Pope Benedict XVI as he seeks to reform the Church in Her Sacred Liturgy. 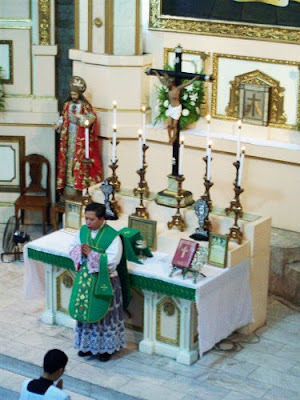 Under "Catholic Categories" in the sidebar is a permanent link to the post Tridentine Latin Mass, which features numerous links that I update as often as possible. 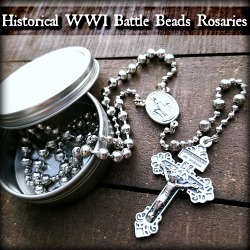 In this post is a list of parishes, chapels, etc. 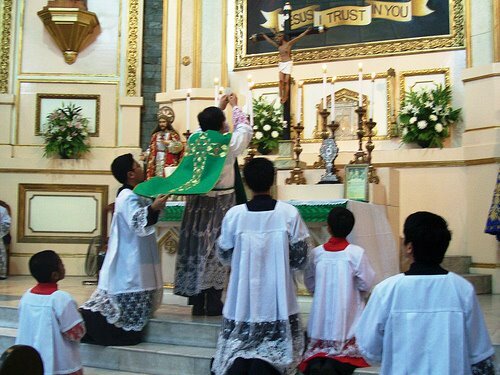 which have begun to offer the Tridentine Latin Mass during these past two years. Please take a moment to look through this list and consider the impact of the motu proprio. We have parishes from around the country and the world. Remember, this is not a complete list, but only the list which I currently have collected. 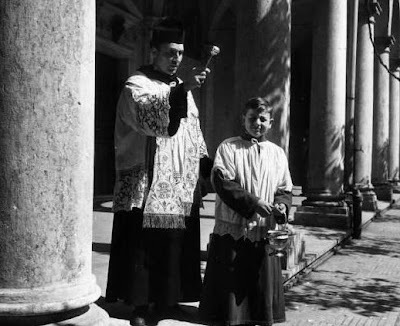 And we must not only remember these priests but the many others who began offering the Mass of All Times despite persecution, rejection, and hostility. At this time I can think of Fr. Robert Altier (Archdiocese of St. Paul-Minneapolis) as well as Fr. Scott Archer (Diocese of Peoria). But these are just two of the many priests who encountered rejection from those around them because they sought to make available the Mass of All Times. Let us honor them at this time. Also worth remember, the Faithful in Niafles attached to the Traditional Mass were driven from their Church less than a week before the Motu Prorio was signed. Of note among the bishops, Bishop Robert C. Morlino responded to the Holy Father’s motu proprio by designating Holy Redeemer Catholic Church as the site for the celebration of the Tridentine Mass for the Madison area. Bishop Morlino inaugurated the use of the Tridentine Mass at Holy Redeemer by celebrating a Solemn Pontifical Mass at the Throne there on the Third Sunday of Advent (December 16, 2007) [Source]. Consider visiting these parishes and/or writing to the pastors to express your support. I have written around half of these parishes, inviting them to share how the Traditional Latin Mass has benefited their parish. If anyone responds with an article, I will publish them on the website as they become available. And do remember to pray for these bishops and priests as well as all priests and bishops who celebrate the Mass of All Times. At this time I also request prayers for the priests and bishop of the Society of St. Pius X, so that they may no longer be slandered and detracted. 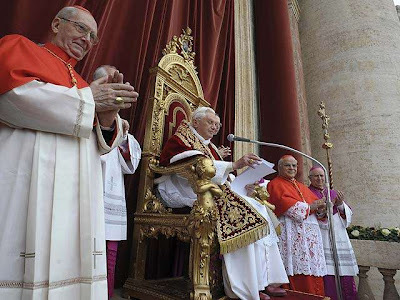 Remember that it has only been two years since the promulgation of the motu proprio on July 7, 2007, which took effect on the Feast of the Holy Cross, September 14, 2007. 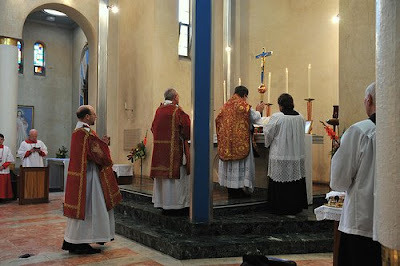 It was on September 14 that countless numbers of Tridentine Masses were celebrated such as the following one. Here is a list of some of the many places that offered the Tridentien Mass on September 14, 2007. As you watch some of the scenes from this Mass in Honor of the Promolgation of the Motu Proprio at St. Patrick's Cathedral in the Archdiocese of New Orleans, please enter into the spirit of joy event in the Liturgy and the music. Even though this Mass remembered the death of our Lord, it focused more particularly on the Cross as the Instrument of our Salvation. Let us now move forward, seeking to help the restoration of all things in Christ (i.e. E Supremi, Encyclical of Pope St. Pius X). 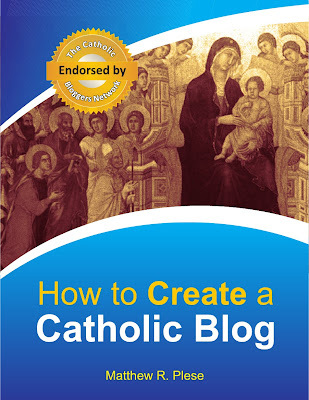 A Catholic Life Blog is willing to publish any and all photos of Traditional Liturgies and articles concerning them, in an effort to help this Restoration. For all such inquiries, please write me through the email address in my Blogger Profile.